Today we are happy to announce that Azure SQL Database Threat Detection will be generally available in April 2017. Through the course of the preview we optimized our offering and it has received 90% positive feedback from customers regarding the usefulness of SQL threat alerts. At general availability, SQL Database Threat Detection will cost $15 / server / month. We invite you to try it out for 60 days for free. What is Azure SQL Database Threat Detection? 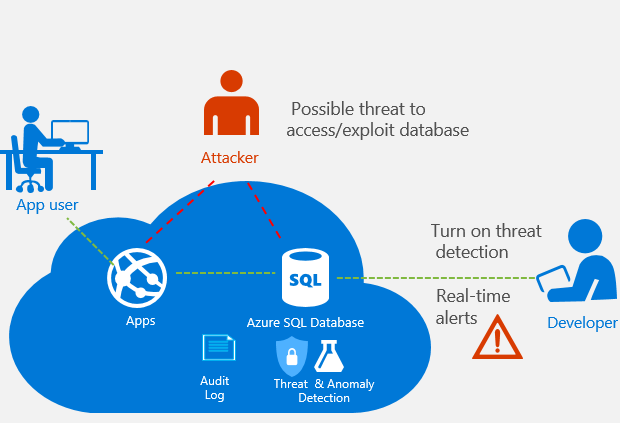 Azure SQL Database Threat Detection provides an additional layer of security intelligence built into the Azure SQL Database service. It helps customers using Azure SQL Database to secure their databases within minutes without needing to be an expert in database security. It works around the clock to learn, profile and detect anomalous database activities indicating unusual and potentially harmful attempts to access or exploit databases. Just turn it ON - SQL Database Threat Detection is incredibly easy to enable. You simply switch on Threat Detection from the Auditing & Threat Detection configuration blade in the Azure portal, select the Azure storage account (where the SQL audit log will be saved) and configure at least one email address for receiving alerts. Real-time actionable alerts - SQL Database Threat Detection runs multiple sets of algorithms which detect potential vulnerabilities and SQL injection attacks, as well as anomalous database access patterns (such as access from an unusual location or by an unfamiliar principal). Security officers or other designated administrators get email notification once a threat is detected on the database. Each notification provides details of the suspicious activity and recommends how to further investigate and mitigate the threat. Live SQL security tile - SQL Database Threat Detection integrates its alerts with Azure Security Center. A live SQL security tile within the database blade in Azure portal tracks the status of active threats. Clicking on the SQL security tile launches the Azure Security Center alerts blade and provides an overview of active SQL threats detected on the database. Clicking on a specific alert provides additional details and actions for investigating and preventing similar threats in the future. Investigate SQL threat - Each SQL Database Threat Detection email notification and Azure Security Center alert includes a direct link to the SQL audit log. Clicking on this link launches the Azure portal and opens the SQL audit records around the time of the event, making it easy to find the SQL statements that were executed (who accessed, what he did and when) and determine if the event was legitimate or malicious (e.g. application vulnerability to SQL injection was exploited, someone breached sensitive data, etc.). During our preview, many customers benefited from the enhanced security SQL Database Threat detection provides. We would like to thank all of you that provided feedback and shared experiences during the public preview. Your active participation validated that SQL Database Threat Detection provides an important layer of security built into the Azure SQL Database service to help secure databases without the need to be an expert in database security.